American Sniper is one of the most controversial films as of lately based off the subject of the matter. Does the film succeed in changing minds about the subject matter or only make it worse? Now I should state first off that as a film and being looked at as a film it isn’t too bad. Go into it with little to no background knowledge or without looking into too many details of the real life story and I found it enjoyable while still disturbing. The film follows Navy Seal sniper Chris Kyle who after joining the force soon moves up the ranks becoming the most lethal sniper they’ve had tries to balance going between war while still having a life at home while dealing with the trauma that war has inflicted upon him. It shows what he goes through while overseas in war to attempting to go back home and deal with attempting to live a normal life after being in war. American Sniper sometimes though has a hard time determining if it wants to be an action movie or a heavy drama. The action scenes are tense (though the close up action scenes do feel a bit generic) but the sniper scenes are first class. You truly do see and feel the tension as you watch this man shoot and kill people without missing a breath. Going from an action scene to a drama doesn’t seem to always work though. The constant jump in genre does start to ware down though because it becomes tiresome to attempt to build a dramatic set or mood only for an action scene to then take place. 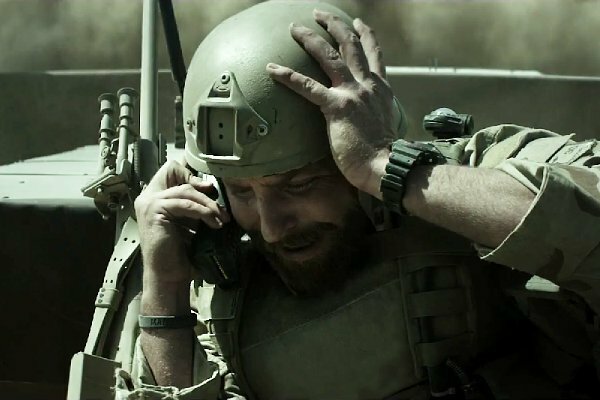 Bradley Cooper though will be a name you’ll see winning many awards for his role as Chris Kyle. He is able to portray a man who truly believes that serving his country is more than important than all and that taking the lives of others oversea is just another days work. Watching his expression as you see him kill and seeing the look in his eyes of just pure calmness is almost frightening to see. Sienna Miller looks unlike herself in the role of his wife who is struggling to rise a family without him while he constantly comes and goes, each time coming back more damaged than he left the previous time. Seeing her attempt to set his husband back into a normal life while slowly watching his mental decline is a tough thing to act and she deserves all the credit she will be getting for it. In the end a film like this is a tough thing to grade because of the subject matter and peoples personal opinions on it. Director Clint Eastwood has done a great job of making a film of this no doubt. Love or hate what it’s about but there is no doubt that American Sniper is a well done and thoroughly entertaining film. Leave the opinions aside and you’ll enjoy this one for sure.